That’s returned Peace Corps Volunteer (RPCV) Philipa von Kerckerinck’s advice for anyone interested in starting their own organization, something she did after returning from Peace Corps service and identifying two of her passions: yoga and the developing world. In 2007 Philipa began her service as a Volunteer in The Gambia, where she taught General Science to 11th graders. It was during her Peace Corps experience that Philipa learned how to function in a culture radically different from her own. Responsible for 180 students from different cultural and educational backgrounds, Philipa learned the importance of flexibility, perseverance and maintaining a sense of humor when handling life’s challenges. In her four classes of 45 students, Philipa quickly learned one of the golden rules of development: you can’t teach the top level until you’ve laid a solid foundation for the basics. 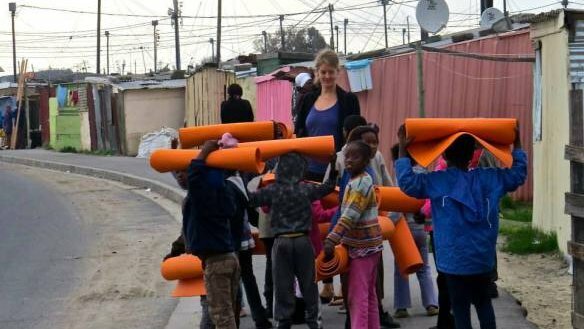 Today Philipa has taken all she learned in the Peace Corps, paired it with graduate studies in development at The New School and created Roots Tribe Yoga (RTY), a non-profit organization that uses yoga to empower youth in Cape Town, South Africa, to take initiative and make healthy decisions in their lives. Roots Tribe Yoga brings yoga to children that otherwise might not have access to it and introduces a unique approach to community development. During the first month, children who’ve shown an interest in the program learn self-awareness and self-love through yoga postures that help them tune into their body and observe the way their body reacts to different poses. Meditation sessions and games are intertwined with yoga class to spark introspection. By the end of the first month, students are able to explore their strengths and appreciate their individuality. During the second month, students are encouraged to apply the same tools of awareness to their relationships with others. Concepts such as giving and receiving, as well as reacting and responding, are taught through partner yoga poses and various games that help the children give easily and receive gracefully. Breathing exercises are used to brainstorm the role each person plays in our lives, and fun homework assignments, such as communicating with someone without words or giving someone new a hug or a smile each day, help children build trusting relationships and improve verbal and nonverbal communication. In the final month, students combine what they have learned about themselves and their relationships into a notion called “the tribe.” They explore themes such as unity, interconnectedness and what it means to be both an individual and part of a group. After learning about personal strengths and teamwork, students discuss interconnectivity and how they can have a positive impact in their communities. “It is important to combine the notion of holistic well-being and the world of development. The Roots Tribe Yoga curriculum helps students to acquire the tools they need to make their own healthy decisions and find strength from within,” Philipa says. She explains that yoga equips people with the tools to address life’s issues in a cost-efficient and sustainable way. What sets RTY apart from a traditional yoga program, Philipa explains, is that Roots Tribe Yoga is aimed at developing strong and confident individuals, who are empowered through the benefits of yoga to make the changes they wish to see in their communities. Five years from now, Philipa sees Roots Tribe Yoga as a well established and respected nonprofit organization. Currently she is working to expand the RTY Ambassador program, which allows qualified individuals to start their own RTY program in their area. It is her hope that RTY Ambassador program will grow to reach more and more children worldwide and that currently serving PCVs with a love for yoga can bring RTY to their corners of the globe as well.